As it is National Eczema Week I thought my next blog post should follow that theme. I have mentioned a few times that my eczema has been causing problems in recent months. Stress has always triggered my eczema so I am blaming the day job rather than diet or skincare. My skin is hot, angry red and itchy as hell at times and that is where the Essential Care Repair Lotion comes into its own. Essential Care developed the product from personal experience of atopic eczema so you know that you are in safe hands. The lotion contains calendula and chamomile, two of my favourite ingredients because of their effectiveness on my sensitive skin. The formula also contains chickweed (to relieve itching), olive oil (to moisturise) and aloe vera (reduce inflammation & promote healing). The packaging is a pump bottle so that's always handy to avoid spills. It is very runny and light but that makes it rather good for easy absorption into skin. It also makes application pleasant because you do not need to pull or drag the skin when applying. To a certain extent I can live with my ugly skin but I cannot stand the need to scratch. I honestly feel as if this does a fabulous job at relieving the itch. It just works for me. I still love balms for my eczema but this is especially nice when the weather has been hot and sweaty. My biggest patch of eczema is on my chest, around my boobies where my bra sits. The lotion sinks in quicker than balm which means I can get dressed and not worry about getting residue on my underwear. 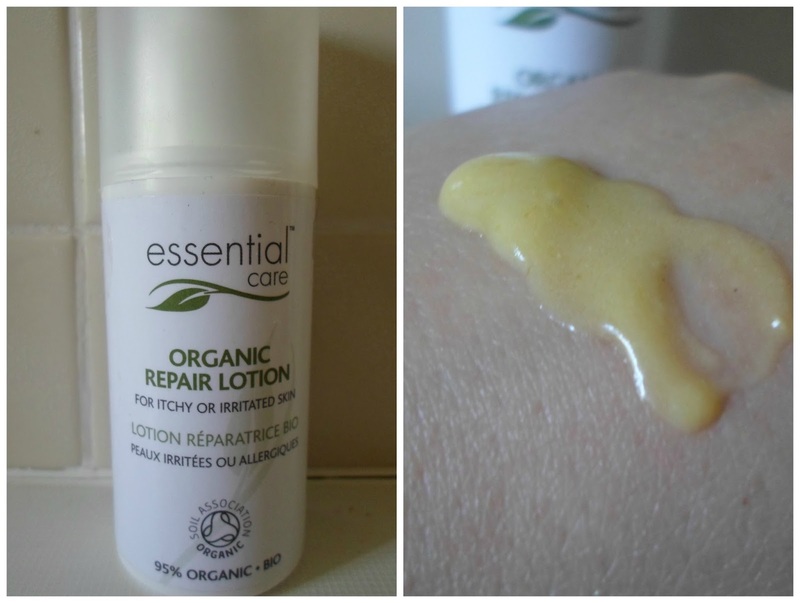 Repair lotion is suitable for Vegans which is great because I know that many of the balms I recommend contain beeswax. With Essential Care you also know you are getting Organic ingredients and zero nasty ingredients. If you have an itchy skin condition then I think you should consider trying this product. Repair Lotion is also suitable for babies and children. I have grown very fond of Essential Care products. I honestly can't find fault and I am happy to recommend to others. Sounds interesting I will have to look into this one! This sounds lovely Sarah. I had the opportunity to try one of their products last month and was really impressed by it. This lotion sounds great, especially as part of an after sun care routine. Great post!